Panama’s San Blas Islands are exotic, friendly, and relatively nearby; often a port of call on Panama Canal itineraries, including those featuring partial transits of the Canal. They form an archipelago consisting of 378 islands scattered around in an area of 100 square miles in the northwest of Panama facing the Caribbean Sea. Many of the islands are uninhabited, with some of the larger ones being inhabited by the Guna or Kuna Indians, an indigenous, gentle people of the area. 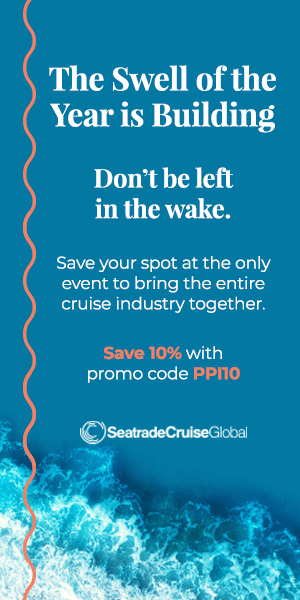 Our ship, Holland America’s Amsterdam, dropped anchor near a village in Carti Island — the second port of call on the Amsterdam’s 2019 World Cruise — and tenders brought us ashore to explore the village and meet the islanders. Some passengers have told me they hate tender ports — I don’t; I see them as places where I get a free harbor cruise. Going in via tender to one of the San Blas Islands, we enjoyed the views of several tiny islands located in close proximity to each other — many with thatched- and tin-roofed buildings — and we were also treated to views of the sea panoramas where we could see ulus or cayucos, the Guna’s dugout canoes, 15 to 25 feet long. As the tender leaves the ship, there is another plus: I have my camera ready to take a nice shot of the vessel at anchor and, as we approach the island, some shots of the port from the sea. These are colorful several-layer reverse appliqué cloths, with handiwork depicting birds, turtles, snakes, fish and other local animals as well as abstract designs. The molas, in bright tones, including red and orange as well as black and other colors, were displayed on ropes outside modest homes made of wood and with thatched roofs, and were absolutely beautiful (a fellow passenger told me some intricate designs often sell as primitive art for $200-$300 in New York City galleries). Some of the molas were incorporated onto bags, blouses, and dresses –eye-catching wearable art. 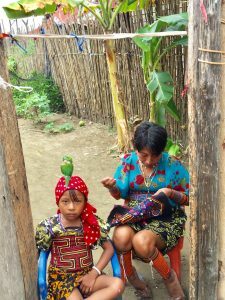 “Mola,” in fact, means “clothing” or “clothes” in the Dulegaya language of the Guna. Most molas we saw were loose rectangles and squares of cloth often 12 inches by 12 inches, suitable for framing or for sewing on to apparel and bags. 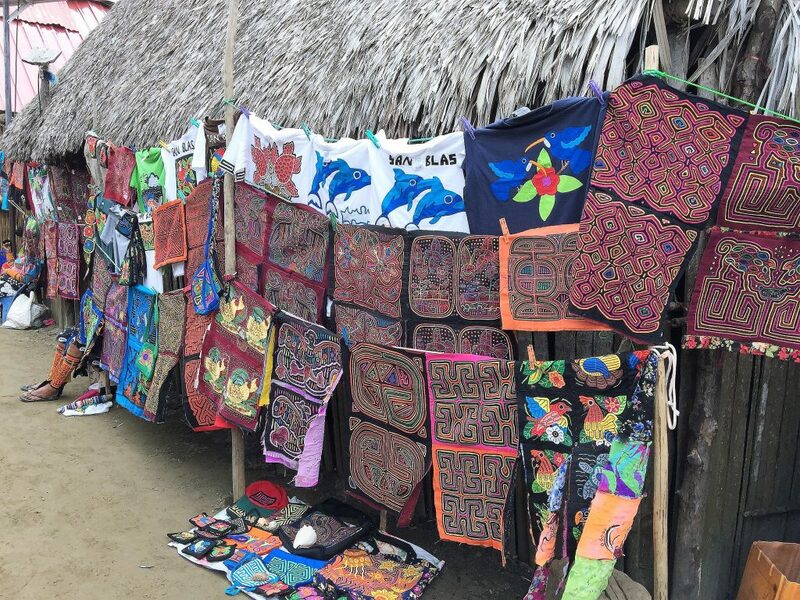 The molas are the handiwork of the women of the San Blas Islands, where the society is matriarchal. The men of San Blas fish and gather the coconuts that are, along with tourism, the mainstays of the economy of the islands. The molas, either as wearable art or framed, make excellent, exotic souvenirs of a cruise. Many sell for $20-$50 and haggling is permitted. 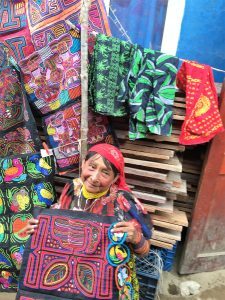 But considering that complex molas can take considerable time to create — anywhere from two weeks to six months — I do not haggle here. Scarves and the colorful beaded bracelets that are part of the Guna women’s traditional garb also are popular souvenirs. Many of the village women, wearing traditional dress and some gold jewelry, including nose rings and earrings, as well as a tattooed black line down their nose, sit outside their modest small houses and are glad to talk about their molas, how long it took to make them, the source of inspiration for them, colors used, etc. 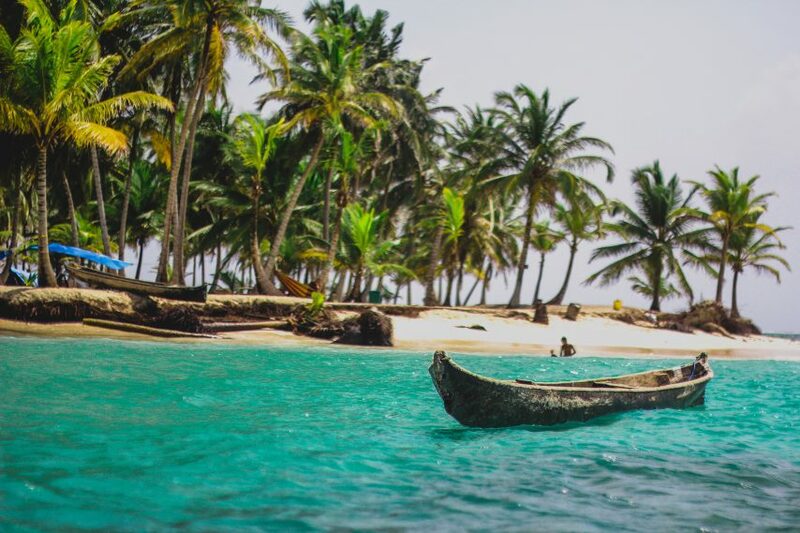 We talked to some of the islanders — many speak some English, and most speak Spanish, as the islands are an autonomous region of Spanish-speaking Panama. They liked to talk about their islands and their life. Some of the children brought their pets, including birds, kittens and puppies, to show to visitors — a good way to “break the ice” in this tropical spot. Taking a stroll in the village, passing the school, and hearing the children reciting their lessons (if your visit falls on a weekday) is fun. We saw the small grocery store, a place selling cold beer, and a place where they cut hair — one of our fellow guests got his hair cut for $5. Most of the islands have beaches, so spending time on a coconut-palm-dotted, white-sand beach is a popular pastime before taking the tender back to the ship. If your time in port allows, you may be able to arrange a snorkel trip through the locals.